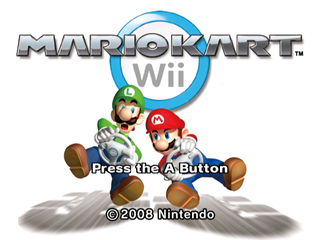 Mario Kart Wii is the sixth game in the series (not counting Arcade editions), which introduced bikes and... Mushroom Gorge. 4.4 Network Debug Messages "DWC_Log"
You though Smash 3DS had a lot of english text differences? This game has almost completely different English text! A lot of things to speculate upon. All the content that died along with Nintendo WFC. Petey Piranha's icon appears in the game files. He was a playable character in Mario Kart: Double Dash! !, but was scrapped here. Rarrrrrrrrrrgh!!! Paratroopa was also a playable character in Double Dash!! Interestingly, he uses a different pose here than in the final Double Dash!! icon. This same icon can be seen in early screenshots of Double Dash!! This was probably the one to be cut earliest in development, as Petey and the Hammer Bro are facing left and fit along with the final character icons, whereas this one stands out like a sore thumb. An icon of the Hammer Bros. exists in the game files. This would have been the Hammer Brothers' debut in the Mario Kart series. Apparently, there was going to be a Mii Outfit C. Oddly, though, it has a different icon compared to Outfits A and B. While Outfits A and B are circles with "Mii" on them, C appears to be a grey jacket with the letter "C" on it, suggesting it didn't get much further than testing. Leftover parameter data for Mii Outfit C still exists in the game, like character identifiers, parameters for the size of the Mii's head, etc. Using a code to replace every icon on the character selection screen with the unused character identifier value for Mii Outfit C, the unused icon will appear in all the slots. When using the character, it will work just like Mii Outfit A. The minimap appears to be missing, but it is present, it's simply too large to fit on the screen. Checking the map model inside the course file reveals that it's the same one as for the game's own Mario Circuit. The lighting is a bit darker. The Piranha Plants are missing their pipes. The Chain Chomp is missing. The little humps near the goombas are the same shape as in Mario Kart: Double Dash!! 's version. The collision seems to be unfinished. When driving on grass, the game acts like the player is driving on dirt, the humps and the bridge are not trickable and the course's collision is bouncier in general. Some textures' animations, like those for the water surrounding the castle, are unfinished and don't loop properly. Intro, replay, and results cameras are not present. Shadows don't give off a 'shading' effect to anything that passes under them. No item boxes are present in VS Mode. While the course does mostly function in VS mode, since it has CPU routes and checkpoints, the game will crash when one of the final two Piranha Plants attempt to chomp at a CPU racer or when a CPU reaches the last jump of the course. There is an .szs file for the multiplayer version of the course (old_mario_gcn_b_d.szs) but it seems to be identical to the single player version. All textures are corrupted, due to slightly missing pointers. The ramp and Chain Chomp objects are missing (however other objects like bushes, flowers and trees are still present). There are no CPU routes, no intro, replay or ending cameras, no checkpoints (so no lap counts), and there're no item boxes in VS. mode. If you replace the BRRES files from Draw Demo into Mario Circuit, you'll get Mario Circuit with stars textured everywhere. However, if you point the Draw Demo MDL0 to Mario Circuit's textures, everything is exactly like the normal Mario Circuit. There is an .szs file for the multiplayer version of the course (draw_demo_d.szs). Its mostly the same, aside from a few textures being differently colored. Appear to be unused versions of GCN Mario Circuit, much like old_mario_gc_b. They lack of object data, and the course model use an old BRRES and KMP format. The names of these tracks are the last names of several people on Mario Kart Wii's Planning team. This file is a unique file across all courses, but it appears to be a representation of Bowser's Castle prior to compilation into an U8 file. The file was possibly included in the final build of the game by mistake. The file has been of great use to hackers, as it contains meta data describing the format of courses, and revealing much information about the KMP file format. The file appears to have been created 2007/08/30 11:50 by Yabuki Kosuke using a piece of software called JMap. It seems as though this was prior to the development of much of Mario Kart Wii as it seems to describe features from Mario Kart DS. There is another JMap file found in the original Wind Waker (version 1.31 from 2002). The version for this file is 2.8.4.1. Every course (including unused courses) from Mario Kart DS is listed in this file, but no Mario Kart Wii courses are listed here. The model contained in course.0 appears to be an early version of Bowser's Castle. It contains a few things that are not in the final course, including a cannon. Get a better description and better video for this. Unused code was found that can be used to put up to four ghosts (or three ghosts and a human player, etc.) into a race at once. It's hard-coded to 4, and trying to load more that 4 forces one to be unloaded. 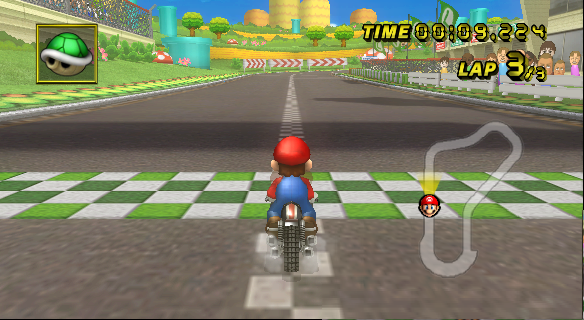 This feature was implanted in Mario Kart 7, although the limit was increased to 7 ghosts. 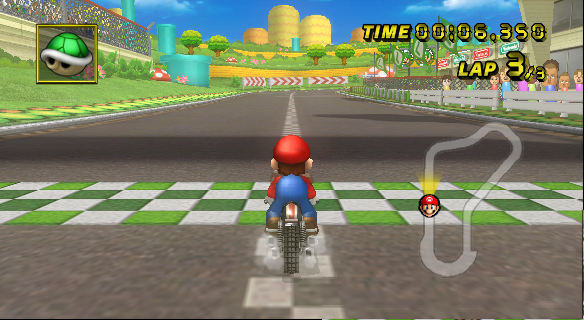 The view is restricted to one ghost, and the race ends when the first player passes the finish line. The game includes an unused copy of the main game engine, possibly a debug or earlier test build. It includes a performance monitor consisting of three bars displaying frame timings on the bottom of the wrist strap screen, as well as an animated exception handler. The title screen lacks the demo, although the music fades out for it even if you've already advanced past the title screen. The final OK button before entering a race plays the sound effect that plays on any normal button. Races are missing sound effects for drift sparks and tricks, don't seem to render any 2D effects at all, and crash when entering one in VS Mode. Also, according to the exception screen, Mario Kart Wii's one and only relocatable module, StaticR.rel, is loaded +0x4400 in memory, as it is always loaded in the same place in the normal game. Get an image that actually displays DWC messages in the console and possibly a video. DWC_Log is a method providing logging functionality to the DWC library, which is the library used for online mode (Nintendo WFC). When online, the game outputs messages like "I am New Server!!" to the non-existent console. The developers of the game would have had a cable connected to the console allowing them to view the log on development software. The game also contains debugging messages using the printf method, which are also sent to the non-existent console. Blue Shells seemed to have been once intended to be held behind the player before they use it. The game contains a list of values for each item that define what the item does when the player uses it. For example: Red Shell uses 0x01, which means that the item is held behind the player and fires when they let go of it. An item like Star would be 0x00 for the game to immediately use the item as the button is pressed. For some odd reason, Blue Shell is listed as 0x01, which means the item should be held behind the player like a red shell. This doesn't happen because the game has code that prevents it, meaning you immediately fire it. Disabling this code reveals that the Blue Shell has an unused animation for it. There's also an unused action for when a player hits it, which works even if the game is modified so that the blue shell lands on the ground if someone loses it. This song would have played whenever you win a boss at certain tournaments that had them. However, in the final game, winning a boss would play the same song as for winning in battles. The second part of Wario's Gold Mine (inside the mine) has an opening to its track. Since the race always starts outside this opening is never heard. In addition, no online tournaments taking place in this level start inside. Through hacking, it is possible to add more than three laps to a track. Doing so shows that Lakitu actually has extra graphics on his flag for laps 3 through 9! While flags 3 and 4 were used in 2 tournaments, where you race the babies in Cookie Land and race around rooms of DS Twilight House with 5 laps, the flags indicating laps 5 through 9 go unused. The lap 5 flag goes unused because in the Cookie Land and Twilight House tournament, Lakitu uses the final lap flag on Lap 5. A very old American flag graphic. Named flag_blank_00, it was probably meant to display when a player didn't have a region set, but in the final game, the space where a flag would be is empty if there is no region set. A coin graphic from Super Mario Bros. The icon of Mario in the Classic Dragster might have been an early design for the banner icon on the Wii Menu. This Mii is of Shuzo Matsuoka that was sent out to Japanese Wiis in 2007. It could have been used for testing licenses. 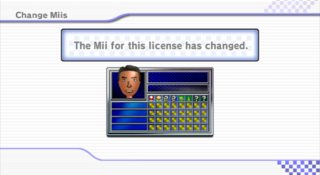 If you convince the game to not load a Mii for the image on the license, this graphic will load instead. 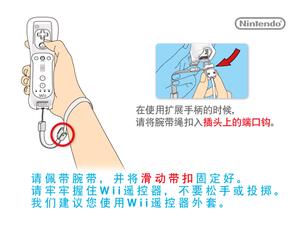 While the Wiimote graphic is used, it's only seen with the Nunchuk. Some additional graphics that are not used. The circles appear to be simple test graphics. An ever earlier Wii Wheel icon, named tt_remocon_han_body_mini3 and found in the files of the Mario Kart Channel. It can be seen on prerelease footage. The bottom right area of the texture of the Honeycoupe has a Chain Chomp with a Prohibition symbol on top of it, and half of a Chain Chomp eyeball. Southwest of the "W" emblem seems to be a Chain Chomp mouth, but with the red part of the mouth removed, and right of that are Chain Chomps teeth. These are never used in game because of the texture mapping. These oddities are in every character's version of the Honeycoupe. Perhaps it relates to the scrapped Chain Chomp item? Or maybe the Honeycoupe was originally going to be a Chain Chomp version of the Piranha Prowler. An early version of the female mii's body (used in the photo you get for completing all the cups in the game). It is found in /Scene/UI/MenuOther.szs/ma_mii_f.brres. There is also a placeholder head texture that is never seen. The Koopa Troopa character texture, in which we can see the unused wing textures. Koopa Troopa and Dry Bones have two unused bones named wing_l1 and wing_r1 in their model files. 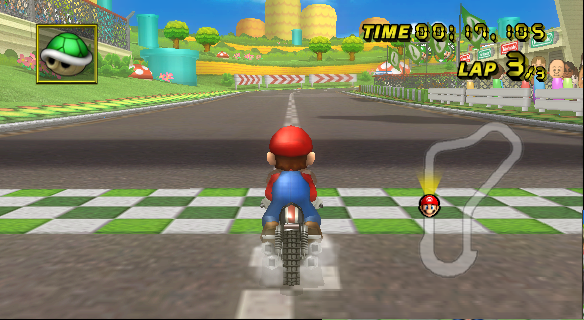 While the bones aren't used in this game, they were used in the game's predecessor, Mario Kart: Double Dash! !, as Paratroopa's flapping wings, since both Koopa and Paratroopa shared the same model in that game. These were probably just leftovers from when Nintendo ported the Double Dash!! model to Mario Kart Wii. The bones aren't referenced in any of Koopa Troopa's or Dry Bones' animations, so if someone were to hack a texture over the bones, they wouldn't move. The fact that Dry Bones has the same unused bones as Koopa Troopa implies that its model was based on the latter's. Baby Daisy and Baby Peach share the same bone structure as both Baby Mario and Baby Luigi. This isn't unusual, as it saves time for the developers of the game, but what is unusual is that the "cap" bone for the baby princesses isn't weighted to move their crowns around when doing tricks and the like, as would be the case with Baby Luigi and Baby Mario. Instead, the crown is part of the "face" bone, despite the crown itself being modelled in such a way that would make it possible to move. If you were to weight it correctly in a 3D model editor, it's revealed they have a unique animation for the crown. The losing animation will jiggle the crown as the Baby Princesses cry. Located within mdf-kart-lg.szs are 4 unused animations for Luigi. 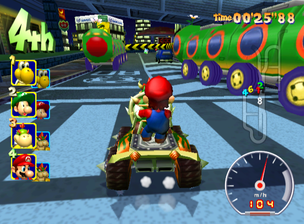 Two of them show Luigi putting his foot on the gas and brake pedals (there are no animations for this in the final game) and the other two are him punching to the left and right. These seem to be leftovers from Double Dash!! While Chain Chomps DO appear in Mario Kart Wii as obstacles in courses such as Mario Circuit or Chain Chomp Wheel/Roulette, there is an icon for the Chain Chomp item, as seen in Mario Kart: Double Dash!! Next to the mouth is the kanji for "temporary" (仮). Interestingly, this Chain Chomp icon can be seen in an early Mario Kart DS without the 仮, but it was replaced by the Bullet Bill in the Final. Three placeholder items labeled "NEW1", "NEW2" and "NEW3" are stored in the game's graphics, and are obviously unused. There is a Mission Mode button switched off on the Single Player and Multiplayer Menu. Since it lacks THPs, the movie clips that appear on the button don't fit well inside it. It also lacks text and a description of the mode. The only available evidence that it is related to Mission Mode is that it takes the player to the Mission Mode screens and its code name, ButtonMR, stands for Button Mission Run which is the Japanese and Korean name for Mission Mode/Missions. The button is located behind the Battle button, so if you make it appear in game, it will not fit with the other buttons. The version on the Multiplayer Menu is also located behind the Battle button. And for some odd reason, it loads the "Controller Registration" screen, despite it being codenamed ButtonMR. It could possibly be the game doesn't have a screen for it to load, so it just acts as the next button in the table, which is usually the back button. That is not the case, however, as unlike the Single Player screen, each button's linked screen is defined by its own unique code. The code for ButtonMR is different than the code for the back button, so changing the screen the button links to will not change the screen the back button is linked to. It couldn't have been initially intended to link there by the developers, because the code name is ButtonMR, and MR is short for Mission Run, so it either was a placeholder, or that's where the Mission Mode screens were initially placed. The Mission Mode screens can't load on the Multiplayer Menu, since its main archive, MenuMulti.szs, is missing necessary files. Normally this feature is accessible VIA the Mario Kart Channel, but it actually has a button on the Wi-Fi main menu as well. This button's codename is ButtonGhostBattle and it uses the same text ID as the button in the Mario Kart Channel. Unlike the Mission Mode button, this one isn't hiding behind another button, and if we turn it on we can see that it was supposed to be located below the Friends button. Sadly, unlike the Mission Mode one, this button has no properties linked to it, so it does nothing when pushed. On the Online Time Trial Rankings screen is a button called ButtonELORanking, It has no text or behaviour associated with it, but from its name we can guess that it was supposed to be some sort of leaderboard for the online players with the highest ELO, which was later implemented in other games such as Mario Tennis Aces ("The Elo rating system is a method for calculating the relative skill levels of players in competitor-versus-competitor games." and Nintendo probably just renamed it to VR). This feature was completely scrapped in the final game, probably because the VR system isn't the most in depth thing ever, and it was quite easy to max out your VR. Also on the License Settings screen are two more button layout (.brctr) files; FixDriftModeButton.brctr and FixDriftModeMovie.brctr. Loading them in-game results in this screen. The first two buttons seem to ask for a drift type, and the third button's purpose is unknown, but based on the code name, ButtonUnfix, it seems it would have once disabled the default drift selection. This is believed to be the screen DriftMode would link to. On the Character Select screen, there are 4 button layout files for the three weight classes and one for both Mii outfits. There are also three separate layouts which are chosen depending on how many characters you've unlocked. On the fully unlocked screen, there are a total of 10 unused buttons. Three of the unused buttons are shared evenly across the 3 weight classes, meaning each class has an unused character. The last seven are for the Mii outfits. It would normally be likely that the 3 unused buttons for the weight classes were just from a programmer who, while entering the number, didn't realize 0 also counted as its own button. But that is most likely not the case as this doesn't happen with any other screen layout. The buttons all merge and stack in the exact same position, which isn't a position that fits with the used buttons around it. They don't have any character IDs assigned to them. They don't have any delay for the animations when the game enters the screen, so they come on screen at the exact same time as the top row of characters, which they aren't close to at all. The unused Mii buttons are all over the place. Their horizontal positions all appear to fit with the rest of the buttons though, which isn't the case with the other buttons. All but three of them have character IDs attached to them, including the unused Mii Outfit C IDs. Like the unused character buttons, these also have no animation delay for entering the screen, causing them to load way before all the other Mii buttons. The Mii Outfit C buttons just load the Mii Outfit A ID without modifications. A screen that appears if there are no ghosts for a given course. 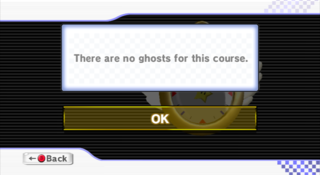 This screen is never seen, since every course has a staff ghost on it. - Small Miis use Rosalina's intended stats, making both characters the only ones that use the same stats slot. - Medium Miis use Small Mii's intended Stats. 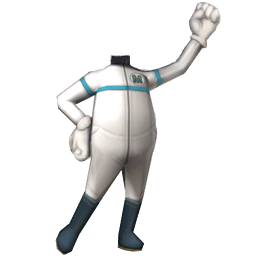 - Large Miis use Medium Mii's intended character stats, which results on their programmed stats to become unused since they're not assigned to any character at all in-game. Below is a table comparing the unused (intended) stats with the actual ones used in-game. This can be proven by modifying the character stats for Large Miis. Whatever changes made will not affect the character stats for Large Miis (nor any other character in the game). A very obscure glitch where if you are playing 2 player online and someone else in the lobby is using a Heavy Male Mii Outfit A on either the Wario Bike, the Shooting Star or the Phantom, then their Mii will be constantly in a T-Pose. The reason this happens is because Nintendo seems to have forgotten to put the Mii in the sitting back position in files le_bike-la_mii_m_4.szs, lb_bike-la_mii_m_4.szs, and lc_bike-la_mii_m_4.szs. 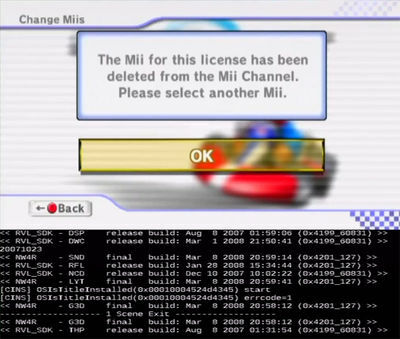 This does not happen when you play as a Mii, and it doesn't appear anywhere else in the game because Mario Kart Wii loads higher quality versions of those files for offline play and single player modes (and these files don't have the glitch). 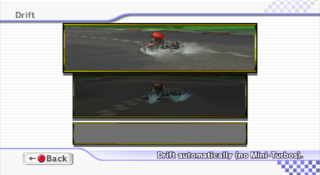 If CPU racers were allowed to use Miis, then it would be possible to view this in 4 players multiplayer too. There's a bug in the game's code that causes the minimap character icons to be bigger than they are intended. When playing a normal race, the icons are the normal size, unless you've played Time Trials. When the game launches, these icons are set to a specific scale. When playing Time Trials, these icons are made larger because the only other racer is the ghost. These icons aren't scaled back down when you quit Time Trials so they remain a bigger size until the game is reset. In VS mode, nametags of players are only drawn when they are a certain distance to you, if they are too far then they will not be drawn to the screen. However, in battle mode, the nametag will be drawn regardless of how far away the other player is from you. If you enter a battle, quit and then enter a VS Race, then the nametags will be drawn as if it was a battle. Which can help when playing competitively. The Giant Pokey on Thwomp Desert competition actually sets flags that changes how the sand physics work, and it no longer constantly pulls you inward. If you play this competition and then go play battle mode, the changed physics will carry over. This is particularly problematic for online play, as it could give quite a huge advantage. Luckily this glitch could only be performed when the Giant Pokey competition was the one currently running. StaticR.rel refers to the unused "draw_demo.szs" as "draw_dmeo.szs", perhaps this is why it was scrapped? An empty folder named debug can be found in the game's file system. Its exact purpose is unknown. File paths in the executable referring to this folder also contain names of letter texture files (the envelope and content of letters) being posted to the Wii Message Board and the ones being received when a tournament starts. Maybe Nintendo used this to more easily test new variants of the letter? A list of files that once resided here are located within the game's code. Another empty folder, called "Race/MissionRun" (Japanese and Korean name for Mission Mode), can be found in the game's files. It has been discovered that file resources for Mission Mode, such as mission_single.kmt and mrXX.szs would have been found here. Within Race/Common.szs is an unused string that references wii_controller.brres. BRRES files are visual model files, but a file of this name/description exists nowhere on the disc. In the game's code, there is a definition of a BRASD folder inside the of character archive files. (In the final game, they are located in Race/Common.szs). Oddly, Dutch is the only selectable language in the Wii Menu that is not available as a language option for Mario Kart Wii, but if your Wii is set to Dutch, the home button menu and Wii Remote safety screens will be in Dutch, and the rest of the game will be in English. This seems to not have always been the case, however, as the code that detects which language is set in the Wii menu and adjust the game accordingly has an unused pointer to a set of files that end with "_N.szs" (N standing for Netherlands). Strings in the games memory refer to .bms files, but these files exist nowhere on the disc. They were probably similar to BMM Files. BFOG and BFOBJ Files are defined in the code, but the game only uses BFG Files instead, probably because they have a simpler format. This may be a remain from New Super Mario Bros. Wii, as both games share the same EGG library. BDOF (Binary Depth Of Field) is a post-effect file that controls effects like focus, sharpness and blur in tracks. There is unused code that allows the usage of a secondary BDOF file, named posteffect.bdof_demo. This one has the same format as a normal BDOF file, and it seems to be used only in the course introduction if present. 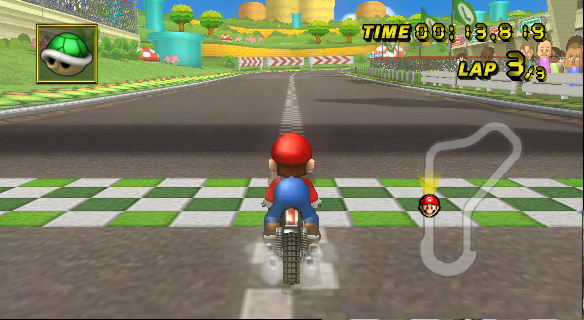 There was originally a Mission Mode planned for Mario Kart Wii. All of the missions that were originally created for the mode have been wiped from the game disc, meaning they have been lost. It is very similar to tournament mode on WiiConnect24. You can even port tournaments to Mission Mode and it will work almost exactly the same, which means that it is possible that missions originally created for Mission Mode were ported over to be tournaments. The menus for Mission Mode have no available text, but the game is trying to load them; they've simply been erased. The only surviving piece of text is "Choose a Mission" after finishing a mission. Similarly, a massive file that would've contained mission parameters is not present, and without it, the mode can't start - unless you simulate its existence. The sub-routine still exists, though. It attempts to load files out of the /Race/MissionRun folder on the disc, but that folder is empty. The files would have contained things like where to place objects, the objective, the score required, the time limit, the engine class, which character and kart you were restricted to, etc. Because this content is missing, it is impossible to know what the original missions were. Some of the surviving stuff is drift restrictions on some levels, and/or a video (but since the videos are missing, the game just displays a still image of the last loaded video). The last level with a video is 2-4, and that's most likely where they decided that they weren't going through with it. The game doesn't even attempt to load any mission that is 3-4 or later. Interestingly, the code trying to load the videos still have the original video names. There is no penalty for losing, as the win music plays, and the results screen is bugged. There seems to be 14 valid game modes. 0x00 Release miniturbos to score points. 0x01 VS Mode. Complete 3 laps before time runs out. 0x02 VS Mode. Complete 3 laps before time runs out. (Seems identical to mode 0x01). 0x04 Break item boxes to score points. 0x05 Hit enemies with items to score points. 0x07 Unknown. (Most likely unused or deleted. A piece of text in StaticR.rel, "EnemyDown03" may indicate it used to be related to modes 0x5 and 0x6, attacking something). 0x08 Gather coins to score points. 0x09 Drive through gates to score points. 0x0A Perform any level of boost start to immediately win the mission. (If you miss the boost start, you can no longer win, at all). 0x0B Hit CPU opponents with certain items to score points. (All projectiles. Stars, Mushrooms, Mega Mushrooms and Bullet Bills do not score). 0x0C Perform wheelies to score. (Faulty, increments score too quickly, increments for wheelies on the spot). 0x0D Get slipstreams from CPU opponents to score points. (However, the score also increases if they slipstream someone, too). There are code names for each of these modes which include an extra 12 of them. The names of them suggest that more were planned but weren't coded. The names are: MiniTurbo, LapRun01, LapRun02, Drift, ItemBox, EnemyDown01, EnemyDown02, EnemyDown03, CoinGet01, ToGate01, RocketStart, ItemHit, Wheelie, Slipstream, BalloonBattle, CoinBattle, Jump+Halfpipe01, Jump+Halfpipe02, Star3, Star2, Star1, A, B, C, D, E.
Though it is unknown, Star3, Star2, Star1, A, B, C, D, and E seem to represent ranking in order from best to worst from the GP ranking design. It is unknown why these are listed as game modes. A piece of text found in the layout files, ジャンプアクション, translates directly to Jump action. This text is in common_w088_mission_movie, which is the file responsible for the layout of the mission select (or sub-level) button. jump_action is the code name for half-pipe tricks suggesting, with the two referenced code names and the tutorial THP file, there was going to be a game mode, or maybe two, with an objective of tricking. There is also supposed to be a level number on the left side of the mission select buttons (buttons on the right). This text is taken straight from the layout file, which only has one text entry, "1-1", but because the limitations of the font, the text would appear as "1?1" in game. The reason why this doesn't appear is because it's applied to the button but then immediately overwritten by the text appearing in the center of the button, the mission name. The text normally supplied is loaded as the text in the center and as the level number. A star is intended to appear on the right side of the level select buttons. It does actually appear, but behind the button making it impossible to see. A button exists for Mission Mode on the Single Player Menu, and oddly on the Multiplayer Menu as well. Both of the buttons crash the game when selected because they link to the Mission Mode screens, which aren't loaded in that context. Loading the Mission Mode screens on the Single Player Menu causes the button to work, but loading them on the Multiplayer Menu crashes because it lacks the necessary files for the screens, like layouts, textures, etc. 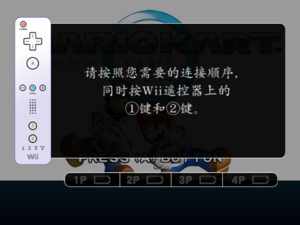 A code to access Mission Mode and more information is available at the Custom Mario Kart Wiiki. Investigate more, it seems this mode was pretty much complete but just never used. to your Wii Message Board via WiiConnect24. 0x1901 Special ghost data now available! These pieces of text were translated to all languages. The game's manual also makes mention of the special ghosts, showing a unique icon that was not used anywhere else in the game, although it's present within the Mario Kart Channel's banner files, named tk_iconGhost_00. In Scene\UI\ are a bunch of unused .bin files that seem to be very slightly early versions of the used .bin files (located in Common.szs). 3 Tilt Strength values for certain karts have been nerfed in the final game. Several Slippery Road Type 2 speed values were changed as well. 2 Camera parameters have been ever so slightly changed. There is an unused movie clip in the game's files that seems to have once represented the background of the buttons on the multiplayer menu. The final game just uses the single player menu's movie clip, single_top.thp. Because of the waving flag and the coins + balloons, it is reasonable to suspect that the the back models, the animated models behind the buttons (like the flag, stopwatch, etc. ), would have been on the buttons instead of behind them. It also seems to be wide enough to cover the entire buttons, while in the final game, it only covers nearly half of the button with a transparency gradient. 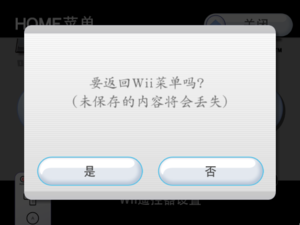 Exclusively on the Korean disc, there are files that seem to suggest that a Chinese version of Mario Kart Wii was in development for the Wii. A Chinese version of the game was announced for the NVIDIA Shield almost a decade since the original's release. Found in the banner data of the game. Found in Boot\Strap\ch\isbn_608x456.szs is a weird file. It is a Chinese splash screen. 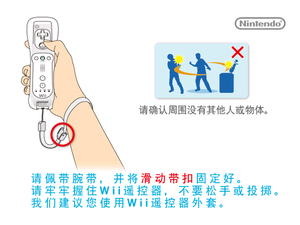 The upper larger texts is the "Healthy gaming advice", a 28-character health & safety advice that is required to be displayed upon a game's startup by Chinese law. 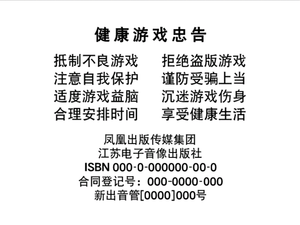 The lower half consists of the publishing house information and a placeholder ISBN with all zeroes (the ISBN will be replaced by the actual one given by the government upon approval). The publisher is the exact same one used by all games published by iQue. "Healthy Gaming Advice Resist unhealthy games, reject pirated games Be aware of self-protection, avoid being deceived Moderate gaming is good for the brain, addiction to games hurts your body Manage time appropriately, enjoy a healthy life"
If you replace the normal homeBtn file with this one and load it in game, it is still mostly functional, besides a few missing bits of text. The game is referred to internally as "RevoKart". "Revo" is short for "Revolution", the Wii's internal project name. Across different regions, certain tracks and vehicles have different names. These are the names that differ between the European and North American releases, along with a direct translation of the Japanese original (not counting retro courses). This page was last modified on 20 April 2019, at 22:12.